Saturday January 23rd was the actual day of the event, however I wasn’t able to update this until now. The event started at 10am and we played three games of Warhammer 40,000 to determine a winner. There were 10 people signed up (with a few more on a waiting list) but a few days before someone dropped out which allowed one of my fellow A-Club members (Les Sohier) to join in. Unfortunately, the night before, another person dropped out and no one was able to replace him so officially only 9 players were there (with 1 ringer) and there were a whopping 7 awards to be handed out plus 3 door prizes (A Valkryie, Hive Tyrant and Ork Trukk). Best Army List – Everyone is encouraged to hand in an army list that is more than just hand written or printed army builder list; Creativity that encompasses the hobby. Favourite Army – All Players vote on who they think has the coolest army at the tournament, taking painting, conversions and models into consideration (even display bases if the army has one). Favourite Model – Each person has an option to nominate on of their own models which they think stands out in their army to be voted on when players are voting on their favourite army. Like the favourite army vote, players vote on which model they think is the coolest, taking painting, conversions and even the base in consideration. Best General – The player that exhibited great ability to use his army to its fullest extent and walked away with the most battle points at the end of the day (but did not win overall). Best Appearance – The judges get together during lunch and use a checklist score sheet to judge each individual army on army display, conversions, bases and painting. The person with the highest score as chosen by the judges will win this award. Best Sportsman – After every game, each player scores their opponent on their sportsmanship during the game. 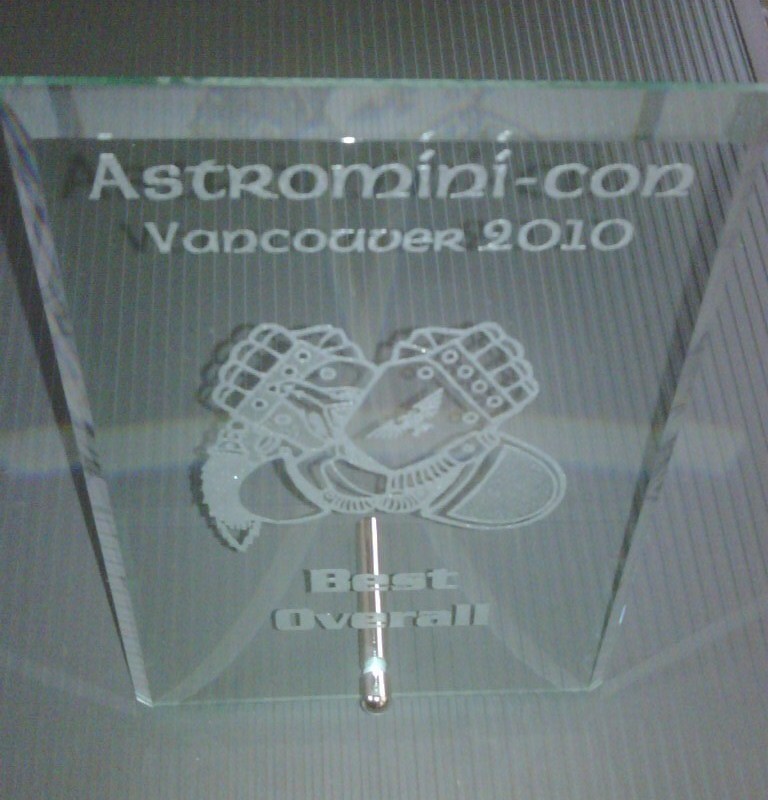 The player who was the most fun to play against usually will win this award. Best Overall – At the end of the day, when all scores are tallied up, it is the person that excelled in all categories that usually picks up the Best Overall award. There are occasions where a players soft scores (his sportsmanship, his painting and all the votes from the players and army list score) will be higher than their battle points. It isn’t always necessary to win all of your games, when you’re fun to play and your army looks good! I played a total of three games that day, the first game was against Dan Miner and his Dark Eldar. We unfortunately read the mission wrong, in a city fight, we actually should have been rolling dangerous terrain for every building we moved through. Of course, I didn’t do much moving into buildings but Dan was in almost every one of them by turn two with the amount of Raiders he had. The end result was pretty close to me tabling him as he only had a Raider left at the end of turn 5, with 2 units of Warriors fleeing off the table. We tied with the battle outcome being 8 to 4 for me (instead of 7 to 7). The second game was against Andrew ‘Muskie’ McKay and his Nurgle army. I’m sure Muskie had been waiting for this re-match for years! The mission was an interesting design of which the entire table was difficult terrain because it was a desert and to shoot anything beyond 12″ you needed a 6 to hit. Since we both had ranged armies and not melee, it was a funny thing to watch us shoot the air. His Landraider got stuck in the sand 3 out of 5 turns (rolled a 1 each time like dangerous terrain) and both my Vendetta and Valkyrie went out of control (rolled a 1 for each of them because of the special rules for the sandstorm) and nearly crashed into each other. It was because of my fast mobility with the skimmers that I was able to take this game, nearly tabling his army and leaving him with his Landraider (it never did anything it got stuck so much) and the unit inside. I won the game with the battle outcome being 12 to 2 for me (instead of 10 to 3). The last game was against the ringer Derrick Maier, who had been apparently doing well! He was one of the judges and had brought along Orks to fill in the last spot so no one would be left without an opponent. The judges original idea for the ringer was to have everyone win against him, but play for the mission modifiers, however as I discovered after our game the ringer had just been filling out the results as they were played including him winning (which is how I ended up fighting him because we had the same win/loss/tie record. If it wasn’t for his Warboss failing his breaktest and running (after he destroyed one of my Leman Russes but before he charged my Commander) I think it would have been a loss for me. We tied with the battle outcome being 9 to 6 for me (instead of 7 to 7). At the end of the day, the three prizes were handed out via a lottery system in which I won the Valkyrie. The awards were handed out starting from the bottom of the list (Best Army List) and working up to Best Overall. Les won the Best Sportsman award with a perfect 30 out of 30 possible score (way to go Les!). It was close for the top spot, Les had 78 points and took 3rd place. Lee had 79 points and took 2nd place (and Best General) and I had 80 points and took 1st place and Best Overall. This entry was posted on February 1, 2010 at 9:13 pm and is filed under Information, Tournament. You can follow any responses to this entry through the RSS 2.0 feed. You can leave a response, or trackback from your own site.